You’re on Funny Graduation Quotes, page 4 of 8 Graduation wishes, messages and quotes. See complete menu at bottom of page. Tips to recent grads make for an interesting read. Below is our collection of favorites. Among the humorous and the witty, hopefully, you’ll find something you like in all of our topics for that fun loving graduate you know. You may build a building or hit someone over the head. The choice is yours. I didn’t go to college, but if I did, I would’ve taken all my tests at a restaurant, ’cause the customer is always right. The Lord gave us two ends: one to sit on and the other to think with. Success depends on which one we use the most. Check out Great Gifts for College Students. Whoever invented spray cheese had to have been a Harvard guy. Try putting your iPhones down every once in a while and look at people’s faces. I too turned to Webster’s Dictionary and it defined Harvard University as a season for gathering crops. Our school was so tough, the student newspaper had an obituary column. The school of experience will repeat the lesson if you flunked the first time. This wasn’t like High School Musical at all. Well, I’m not usually one for speeches – Goodbye! Tip: Play to your audience. Sometimes graduation quotes might work for one person who likes a laugh, and other times not for folks who are more serious. Ask yourself, does the recipient have a good sense of humor? Be Santa Claus when you can. You will never become a howling success by just howling. Life has a very simple plot: first you’re here and then you’re not. You have brains in your head – You have feet in your shoes. You can steer yourself in any direction you choose. You’re on your own. And you know what you know. You are the guy who’ll decide where to go. Lisa, if you don’t like your job you don’t strike. You just go in every day, and do it really half-assed. 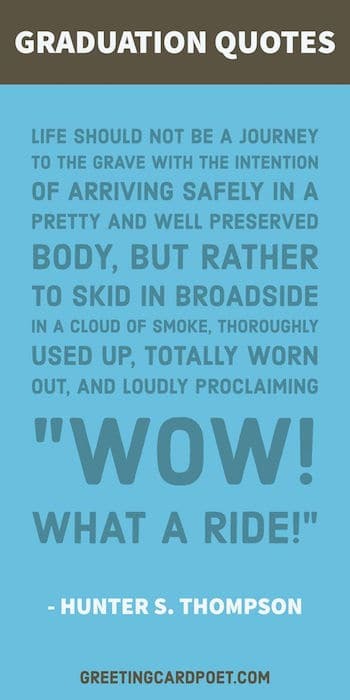 That’s the American way. I couldn’t wait for success. I went ahead without it. It doesn’t matter that your dream came true if you spent your whole life sleeping. If you have any suggested additions, please let us know. Thanks! Isn’t it funny how day by day nothing changes, but when look back, everything is different. The unfortunate, yet truly exciting thing about your life, is that there is no core curriculum. The entire place is an elective. Congrats on getting through the easiest part of life. All that stands between a graduate and the top of the ladder is the ladder. Graduation is a tough day for parents. They go to the ceremony as parents. They come back home as contemporaries. After twenty-two years, they are unemployed. Congratulations on four years of pretending your third pick school was your first choice. We’d like to apply for a refund on your college education. 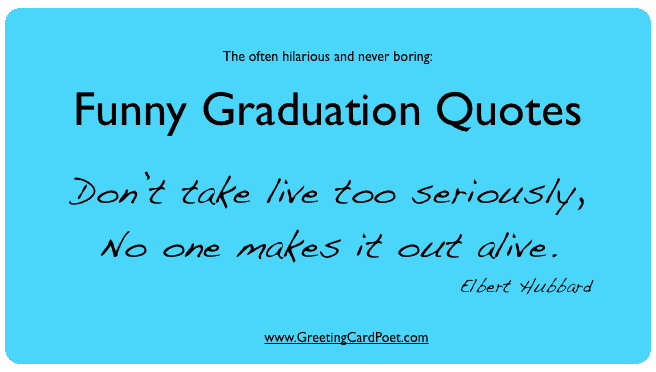 Tip: Use a humorous graduation quotes for photo captions on Instagram and Facebook, in photo books, texts, emails and more. Don’t take life too seriously, nobody makes it out alive. Tommy: Ya know, a lot of people go to college for ten years. Richard: Yeah, they’re called doctors. Friends and classmates are God’s way of apologizing for your relatives. A big shoutout to all of the sidewalks in our town. They kept me off the streets. I graduated so now I’m like smart and stuff. Experience is the only school from which no one graduates. I would’ve gone to Hogwarts but my ACT score was too low. You know that point at your graduation ceremony where everyone tosses up their caps? Isn’t it great that we all celebrate how smart we are by throwing sharp pointy objects in the air? I can’t wait to hear your name horribly mispronounced at the graduation ceremony. Without Google and Wikipedia, would we even be celebrating your graduation today? I lost a bet because you graduated. We always knew you’d barely graduate. Worry is like a rocking chair — it gives you something to do but never gets you anywhere. You’re going to fall down, but the world doesn’t care how many times you fall down, as long as it’s one fewer than the numbers of times you get back up. So long as your desire to explore is greater than your desire to not screw up, you’re on the right track. During a test, students look up for inspiration, down in desperation and left and right for information. High School looks so much cooler on TV. There are only two places in the world where time takes precedence over the job to be done: school and prison. Student: Would you punish me for something I didn’t do? Teacher: Well, of course not. Student: I didn’t do my homework. Group projects make me understand why Superman works alone. Hopefully these selection might inspire you, friends and family. 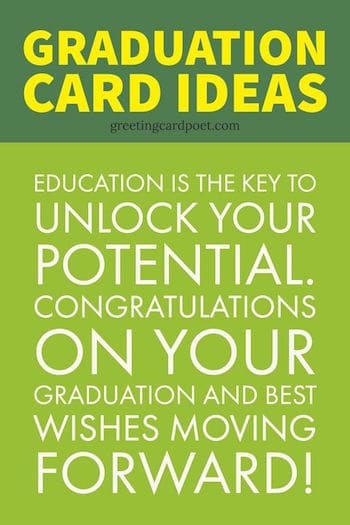 They’re great for graduation, an educator or graduates.